Between your skin and bones, there’s muscle and fat. If you’re over the age of 20 (yes…20! ), and have been consistently inactive, your body will naturally gain fat and lose muscle when not on a lifting and/or healthy (higher protein) eating regimen. This happens as a result of being sedentary, and not engaging muscles. Many of us set the same goal year after year to lose weight. But as the years go by, we're noticing that every time weight loss occurs, the end result is a physique that looks different attempt to attempt. You may even think “I'm looking fatter than I did last time I was this weight.” But why? It's often assumed (*cough* ladies) that there’s no reason to have muscle — if we don’t want to be ripped, or look “manly.” (Really, ladies?…1990 called and wants it theories back). 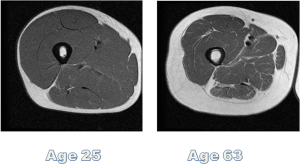 We think that as long as we’re getting smaller, there's no point in lifting (read: gaining or preserving muscle mass). While we may have been able to fool ourselves into believing this at 22, eventually we're faced with reality: muscle equals metabolism. Having less of one, means lowering the other. 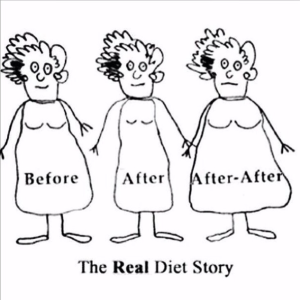 The more times we diet, the more muscle is lost, and fat is gained. 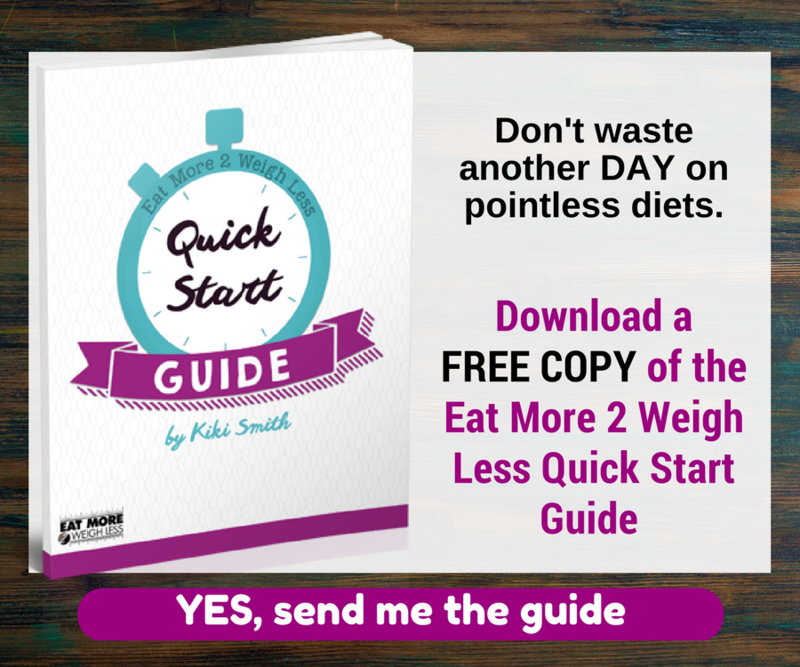 If the weight loss stints are really quick, we've just increased our odds. The faster weight comes off, the more likely it is that we’re experiencing muscle loss and not just fat loss. The more yo-yoing our body does, the more weight we gain each time. 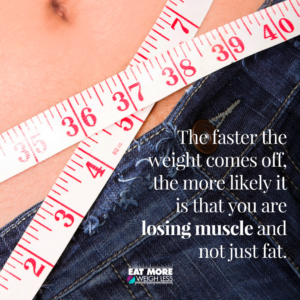 This means we need to lose more weight each time, with more of the loss likely being from muscle mass. We start to notice that we look softer, and all that cardio we used to do, doesn’t “work” anymore. Gaining fat isn’t a difficult job. Our bodies are good at doing so without us even trying. (I doubt I just blew your mind, there, LOL.) To gain muscle, however, we must put forth a conscious effort. While we may tend to think we have too much fat on our frames, the problem instead may be we just don’t have enough muscle. Having too little muscle is like drilling for water in the desert, it's gonna take a heck of a lot more effort – which much less rewarding payoff. 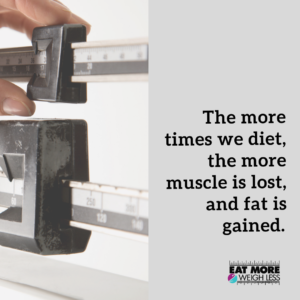 Without a sufficient amount of muscle, our “weight loss” goals will never be sustainable for long. This means that many of us ladies have to get over the fear of weightlifting, and thoughts about how gaining muscle will make us look like a bodybuilder (myth). When it comes to fat loss, programs and approaches that may have worked for you in the beginning aren’t necessarily going to work for you in the long run. This is why it's so important to remember to start small if you’re just getting into the swing of fat loss, healthy eating and resistance training. There are many levels involved to getting to that peak level. Trying to go straight to the highest level leaves you with little room for plateau adjustments (no trump card to pull! ), and typically doesn't provide enough time to develop habits that stick. So take the time to do it right, instead of constantly doing it over. Always have another trick up your sleeve. Pick one thing and nail it before you move onto something else. For example: incorporate more protein (from 90 grams to 120 grams, then 120 grams to 150 grams, etc) in your diet until you master it. *Side note: Metabolism resets are key if you’re a yo-yo dieter or have been on a low-calorie diet for an extended period of time. It’s easy to get caught up in the scale weight, but the key is to think about the long term. Too much cardio and too little food will absolutely lead to muscle loss. Real progress takes time and requires a realistic perspective. 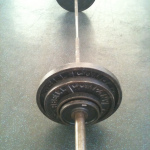 If you/your clients want to get results, they’ve got to start weight lifting. Being skinny doesn’t equal results. Being strong and healthy does. Cross section of thigh muscle, notice what happens to muscle/fat ratio over the years? Plan of attack must change with age. Preserving/building muscle is essential. Ask somebody what their ideal end goal physique is and you’ll often hear “I just want to be skinny and not look like a bodybuilder.” By arming yourself with the proper information and knowledge, you can create a program that combines strength training and a proper diet (i.e. adequate protein intake). Constantly working on those areas (knowledge, lifting, diet) will change your entire perspective on the body transformation process. Gathering information, like taking your own diet history into consideration, can be a very helpful in discovering if you are actually dealing with a muscle deficit. Using this information, you can learn how to train and eat for muscle. Eating around a maintenance level of calories (also known as TDEE) can often prove to be the best approach. If weight loss were easy, everybody would be running around looking like fitness models. The reality of it is that there’s a science and method behind the madness. In order to create healthy, sustainable weight loss, you’ve got to target the fat mass and preserve/add to the muscle mass. Yes, women need to get off the damned tradmill, get over their irrational fear of muscle and weights, stay away from crazy diets and eat more protein. The starvation/cardio culture is like a f@cking cult!